Christianity, Judaism, and Islam are usually treated as autonomous religions, but in fact across the long course of their histories the three religions have developed in interaction with one another. 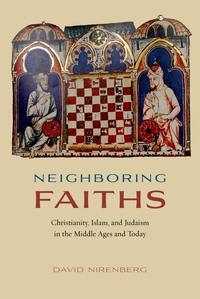 In Neighboring Faiths, David Nirenberg examines how Muslims, Christians, and Jews lived with and thought about each other during the Middle Ages and what the medieval past can tell us about how they do so today. There have been countless scripture-based studies of the three "religions of the book," but Nirenberg goes beyond those to pay close attention to how the three religious neighbors loved, tolerated, massacred, and expelled each other--all in the name of God--in periods and places both long ago and far away. Nirenberg argues that the three religions need to be studied in terms of how each affected the development of the others over time, their proximity of religious and philosophical thought as well as their overlapping geographies, and how the three "neighbors" define--and continue to define--themselves and their place in terms of one another. From dangerous attractions leading to interfaith marriage; to interreligious conflicts leading to segregation, violence, and sometimes extermination; to strategies for bridging the interfaith gap through language, vocabulary, and poetry, Nirenberg aims to understand the intertwined past of the three faiths as a way for their heirs to produce the future--together.